AUSTIN- The private recreational angler red snapper season in federal waters will close at 12:01 a.m. Wednesday, Aug. 22. State waters out to nine nautical miles will remain open. Under an agreement between the Texas Parks and Wildlife Department (TPWD) and the National Marine Fisheries Service that was signed in April, TPWD can establish the opening and closing of the red snapper fishery in federal waters off the Texas coast for private recreational anglers fishing from their own vessels in 2018 and 2019. As part of this agreement, also known as an Exempted Fishing Permit (EFP), Texas must close the fishery when the state’s allotted poundage is reached for the year. The Aug. 22 closing date coincides with predictions by TPWD’s Coastal Fisheries Division of an 82-day season in federal waters with state waters open year-round. 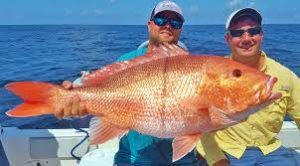 TPWD has been closely monitoring the red snapper fishery harvest during the season through its creel survey program and iSnapper landings data submitted by anglers. “This is a tremendous gain in the management of the red snapper fishery and an excellent model for the scientifically and sustainably based management of our fisheries. More localized management affords opportunities for more flexible seasons and heightened angling opportunities, while simultaneously conserving the snapper stocks we are charged with stewarding. Just as importantly, this highlights the benefits that can be derived when we recognize the regional and state differences in populations and the needs of each state across the Gulf,” said TPWD Executive Director Carter Smith. Anglers may continue to harvest up to four red snappers per day with a 15-inch minimum length limit from Texas state waters.